In my mom's place, they make this curry. This is basically a kerala Iyer recipe. 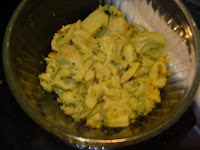 My patti used to buy raw jackfruit, steam cook it, then peel off the skin, mash the jackfruit and make this curry later. 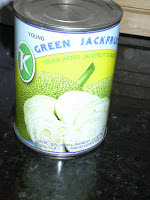 But now a days, peeled raw jack fruit is available in tins. Here is the recipe. First open the tin, drain the jackfruit from it. Grind the coconut and green chillies in blender without adding water and keep it aside. Take a pan, put the drained jack fruit to it, add turmeric powder and salt and 1/4 cup of water and let it cook for 7 to 10 mts. When it is 3/4th cooked, drain the remaining water. Let it cool. Scramble it with hand or using blender. Again pre heat the oil in a pan, add mustard seeds, when it splutters, add urad dhall, asafoetida powder, curry leaves and fry it till golden brown. Now add the scrambled jack fruit to it. Also add coconut + Green chillies to it and mix it thoroughly and reduce the flame. Let it cook and mix for another 3 to 5 mts. A nice aroma of coconut will come out of it. Turn off the stove and serve it hot with rice. This is also a side dish. Hi, I am back with a bang with finally a net connection. All these 10 days were terrible. I love raw jackfruit. But, we bengalis make it the way we make mutton curry - i.e. with lots of onion paste, curd, ginger paste, garlic paste and ghee. Try it out sometime. You will like it. I don't know how to make mutton curry. Bu t I will try yours definitely.